Techno-textiles are fabrics that incorporate new technologies and new functionality into a traditional textile material. Sometimes called "techtextiles" or "technical fabrics," most techno-textiles have their roots in industrial or military applications. Technotextiles are employed in many different applications, ranging across biomedical devices, aircraft, automobiles, electronics, and more, including clothing and home furnishing. Textiles are products basically constructed of fibers. These fibers are frequently twisted together (thousands at a time) to create yarns, and the yarns can be woven, knitted, or braided to make fabrics. When looking at a fabric, it is easy to forget that fabric is really made of thousands or millions of small fibers. However, the fibers are the most important component of the textile. The choice of fibers and yarns can change the behavior of the textile material. Most techno-textiles are developed at the fiber level. By modifying materials thinner than a human hair, the performance of a fabric can change dramatically. Since the dawn of synthetic plastics, techno-textiles have been marketed. One of the earliest examples of fibers made for high-tech application is nylon. As the air force was developing as a significant component of the armed forces, parachutes became more and more important. Parachutes were made from woven silk fabric. Researchers were interested in developing a synthetic substitute for silk to control quality, source, and improve strength. Nylon was an ideal source and rapidly developed to satisfy this market. Recognizing nylon as a silk substitute, however, quickly led people to consider other products made from silk as candidates for nylon. Stockings, which were extremely popular and rather expensive at the time, were identified as a likely market. The success was so great that the public started calling stockings "nylons" within a few years. The increased strength and durability of the nylon compared to silk made this a tremendous success. By the early 2000s, nylon was no longer considered a techno-textile, but rather a commodity fiber. This continues to happen: as new technologies become commonplace and accepted, they cease to be considered high-tech. What at first seem like fantastic applications will likely, within years or decades, become commonplace. One of the most popular applications of techno-textiles is to provide comfort in a garment. Generally speaking, there are two aspects of comfort that clothing can address: perspiration and temperature. A comfortable garment will take moisture away from the body and maintain a good temperature level. Expanded polytetraflouroethylene (ePTFE) has transitioned from the laboratory to apparel. PTFE is the same chemical structure as Teflon, but when it is expanded, some unique properties can be realized. Gore popularized this technology as the Gore-Tex membrane. The basic idea is that the membrane has very small holes in it. These holes permit water vapor to pass, but are too small to allow a water droplet through. Thus, if a person wearing this garment is perspiring, the water vapor can move through the membrane. However, if it is raining, the droplets cannot pass through to make the person wet. Phase change materials are becoming quite popular as a way to control temperature in a garment. 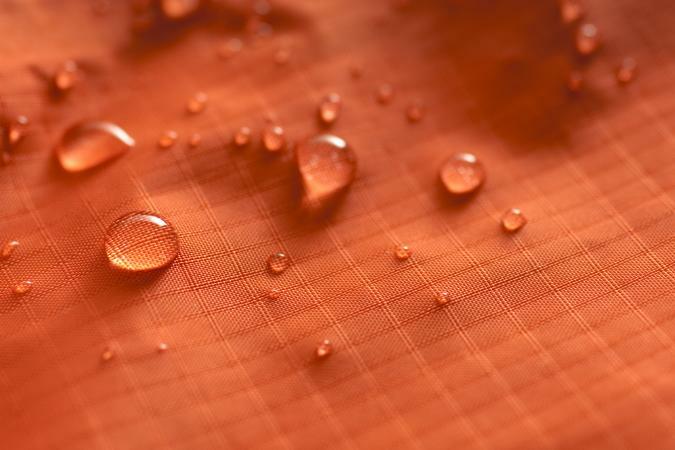 Basically, microencapsulated waxes are embedded into the fabric. When the wax melts, it absorbs thermal energy, effectively cooling the material when it is heated. Conversely, when the molten wax solidifies, it releases heat while the overall system is cooling. The result of this is a material that tries to maintain a certain temperature, effectively taking the peaks of heat and cold away. There are methods to actively change the temperature of clothing as well. Astronauts, aircraft test pilots, and racecar drivers have been using refrigerated clothing for some time. Tubes of coolant are embedded in the clothing and a small pump pushes the cool liquid throughout the garment. Thermal-electrical devices are also being considered. Some of the more exciting possibilities for techno-textiles come from using modern electronics and computer technologies in clothing. The key elements are the use of electrically conductive fibers or yarns so that signals can be sent throughout the garment, flexible power sources, flexible computer equipment, and flexible display systems. Conductive materials in fibrous form, such as metals or carbon, or even conductive polymers such as polyany-line, can be used as wiring within a piece of fabric. These wires can carry electricity to various components, such as sensors, actuators, or computer chips, that are embedded in the garment. Wireless communication devices can communicate information to and from the clothing. For example, Infineon Technologies, AG, is developing a method to incorporate motion detection devices into carpeting. This can be used for a variety of purposes, including controlling lighting to turn on when someone enters the room, or to detect intruders. In addition to detecting motion, the chip can measure temperature, which could lead to applications such as automatic floor lighting in the event of a fire, showing the occupants a path to safety. The motion detection module is woven into the carpet backing. Red wires supply voltage, green wires carry data, and blue wires are ground for Infineon's demonstrator smart carpet motion-detection module. A capacitive sensor in the module detects when a green wire is touched, which lights the red LED. Optical fibers can be incorporated into fabric structures in such a way as to create light patterns on the surface of the fabric. By proper control, the fabric can effectively become a television or computer screen. France Télécom demonstrated such a technology-a fabric display screen. Eventually this technology could be incorporated into everyday clothing or home furnishings. Imagine a simple, businesslike shirt that can be converted into a dynamic flashing nightclub outfit with the flip of a switch. Draperies and wallpaper could become display units so that the pattern or color scheme can be changed to the owner's instantaneous desire. Maggie Orth has developed Electric Plaid for this purpose. Electric Plaid doesn't work by controlling fiber optics, but rather by controlling temperature-sensitive dyes-another techno-textile application. Temperature-sensitive dyes can change color depending on how cold or hot the fabric becomes. Electric Plaid has heating and cooling filaments embedded in the fabric. By changing the degree of heating and cooling at different places in the fabric, Orth has created a fabric that changes color and pattern slowly throughout the day. Sensors to determine such disparate phenomenon as temperature or oxygen content can be created in a fibrous form. Typically these are fiber optics that have Bragg diffraction gratings that can measure small changes in the environment. Because they are produced as fiber optics, they can be incorporated into clothing. A number of companies, such as Big Light and SensaTex, have embedded these sensors into underwear so that the fibers are touching or close to the human body. The information received by these sensors can be transmitted to another location. Some of the life-critical applications for these include infant garments to provide early warning against SIDS (Sudden Infant Death Syndrome), and for soldiers. In either case, information can be sent back to the parents or commander to provide details about the health and well being of the wearer. Should a problem arise, quick response can prevent serious difficulties. If the infant's breathing becomes irregular, the control system will notify the parent who will rush to assistance. If the soldier is wounded, the change in body temperature and heart rate will create a warning for the medics to come to his aid. Not only will the medics know there is a problem, but also a location system on the soldier will allow the medic to find the soldier quickly. This kind of technology is also being transmitted to the world of sports. One of the obvious applications is for training purposes. Both the athlete and the trainer can observe changes in vital signs and determine the degree and efficiency of the workout. At Tampere University of Technology (Finland), researchers have made a snowmobile suit that includes a location sensor and transmitter as well as accelerometers to detect crashes. If a crash should occur, the suit will send a distress call that includes the location of the athlete as well as vital signs. As exciting new applications of electronics in textiles develop, there is a need to provide electrical power to these devices. There are several interesting approaches in development that will see future applications. A few companies have produced very thin and flexible batteries that are about as intrusive as a label. Although these don't provide very much power, they can be sufficient to handle electrochromic devices or even small fiber optics. There are some interesting variations being developed other than batteries. One is a generator that is attached to shoes. A generator creates electrical energy by spinning a magnet through a coil of wire. This is the opposite of making a magnet by wrapping a wire around a nail and running electricity through the wire. The basic idea is to make the heel of the shoe able to move up and down so that with each step the wearer pushes the heel up, which moves magnets through a coil and electricity is generated. Then the shoe is simply connected to the garment to provide electricity. There are a few problems with this idea, such as the wires required to connect the shoe to the clothes, and the fact that the heel of the shoe might be larger than normal. Electricity can also be converted from thermal energy through a process known as the Seebeck effect. In the See-beck effect, two different conducting materials are joined, and when the temperature between them is different, an electric current is produced. This can be great for cold weather environments, where one conductor is on the out-side of a coat, so it is cold, and the other conductor is on the inside by the wearer where it is warm. This difference in temperature can create electricity that can be used for various things, such as charging a cell phone or MP3 player, or finding one's coordinates through a global positioning system. The opposite of the Seebeck effect is the Peltier effect, wherein electricity can be used to create temperature, but not like a heater, rather like a cooler. By proper choice of the conducting materials, the Peltier device can become cooler than the environment, allowing a flexible cooling system. Such devices can be embedded in fabrics. Various companies have developed flexible solar cells. Solar cells convert light into electricity. The recent possibility to make them flexible allows them to be used in clothing and accessories. Recently a student of the author of this article, Lauren Sabia, developed a shoulder bag that incorporates flexible solar cells in the strap and has conducting wires that run to a cell phone holder allowing the solar cells to charge a cell phone when not in use. It is not known what the future holds for high-tech textiles. There may exist far-out concepts such as a tie made from fibers that are semiconductors allowing the garment to double as a memory storage device for a computer. Perhaps yarns will be developed that have muscle-like behavior that allows them to contract, making the sleeves of a shirt give the wearer extra strength or speed. What is known, though, is that most technological advances eventually make their way into textile products because just about everybody wears clothing. See also Future of Fashion; High-Tech Fashion. Bolton, Andrew. The Supermodern Wardrobe. London: Victoria and Albert Museum, 2002. Braddock, Sarah E., and Marie O'Mahony. Techno Textiles: Revolutionary Fabrics for Fashion and Design. London and New York: Thames and Hudson, Inc., 1999. --. Sportstech: Revolutionary Fabrics, Fashion, and Design. London and New York: Thames and Hudson, Inc., 2002.